Covering the various aspects of this fast-evolving field, this comprehensive book includes the fundamentals and a comparison of current applications, while focusing on the latest, novel achievements and future directions. The introductory chapters explore the thermodynamic and electrochemical processes to better understand how electrolysis cells work, and how these can be combined to build large electrolysis modules. The book then goes on to discuss the electrolysis process and the characteristics, advantages, drawbacks, and challenges of the main existing electrolysis technologies. Current manufacturers and the main features of commercially available electrolyzers are extensively reviewed. The final chapters then present the possible configurations for integrating water electrolysis units with renewable energy sources in both autonomous and grid-connected systems, and comment on some relevant demonstration projects. Written by an internationally renowned team from academia and industry, the result is an invaluable review of the field and a discussion of known limitations and future perspectives. received her PhD in the electrochemistry of a binary molten carbonate salts - an electrolyte for Molten Carbonate Fuel Cells. She completed postdoctoral research with Germany’s MTU CFC Solutions. In 2012 Agata received her habilitation at the Faculty of Process and Environmental Engineering at the Lodz University of Technology, Poland, in technical sciences with a focus on chemical engineering. Agata is currently an expert at Airbus Group Innovations at the Department of Energy and Propulsion. She is also employed as an Associate Professor at the Institute of Chemical Engineering of the Polish Academy of Sciences in Gliwice, Poland. She has authored several scientific publications and patents. 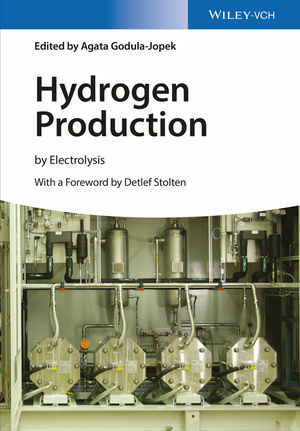 Recently Agata coauthored a book on "Hydrogen Storage Technologies. New Materials, Transport and Infrastructure."